Rhino News, etc. 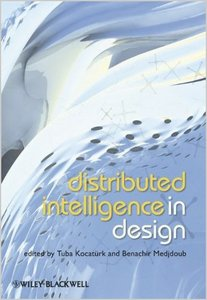 : Book "Distributed Intelligence in Design"
Book "Distributed Intelligence in Design"
This long awaited book, based on the presentations and discussions which took place during the Distributed Intelligence in Design symposium, is now published by Wiley! Distributed Intelligence refers to the interdisciplinary knowledge of a range of individuals in architectural, engineering, and construction -- in different organizations, with different backgrounds, and experience. The book discussed the media, technologies, and behaviors required to support their successful collaboration in design and production, addressing to the changing socio-technical climate in the architectural design world. The chapters address innovative developments, methodologies, applications, research work and theoretical arguments. To present current experience and expectations as collaborative practice becomes critical in the design of future built environments.